Imagine a US senator publicly calling the Chinese “evil people.” Imagine a governor saying African leaders are “animals.” Imagine a presidential candidate claiming Latinos are “liars.” In each of these cases, the media would rightfully explode, condemning the politicians for their overt racism. A notable exception to this, however, exists in the US political system and media establishment: When politicians make ludicrous claims about Iranians, when Republicans deploy orientalist myths about purportedly bloodthirsty Persians in order to sabotage their own government’s attempts at diplomacy, the media largely sit on their hands. The media completely ignored the extreme statement. A Google search shows it was mentioned in a Military.com article (7/29/15) and a piece on the little-known Rapid News Network that seems to have been subsequently taken down. That is it. That was the extent of its coverage. 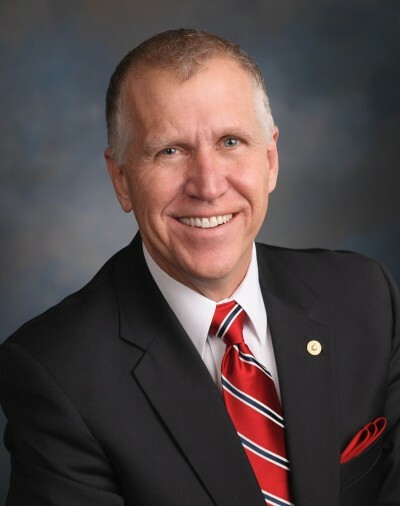 Tillis was not alone. One need only look one state over to see another US senator who spouts anti-Iranian bigotry. 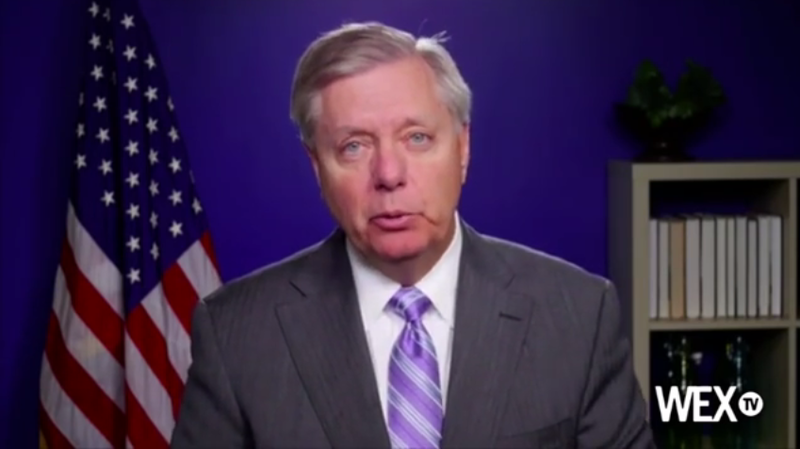 In an address to the Southern Republican Leadership Conference via video in May, GOP presidential candidate Lindsey Graham (R-SC) declared (BBC,5/22/15): “Everything I learned about Iranians I learned working in the pool room. I ran the pool room when I was a kid, and I met a lot of liars, and I know the Iranians are lying,” the senator said. Graham’s racist statement raises concerns about his ability to speak on vital national security matters such as the nuclear negotiations with Iran. Because if you judge an entire people based on your experience running a pool hall-liquor store, do you really have the judgment to keep America safe? Yet this kind of chauvinistic discourse remains a part of US politics, and the media fail to draw adequate attention to it. 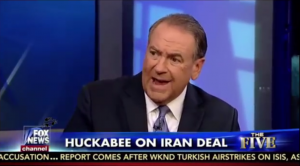 Republican presidential candidate Mike Huckabee said Obama’s deal with Iran “will take the Israelis and march them to the door of the oven,” referencing the Holocaust. 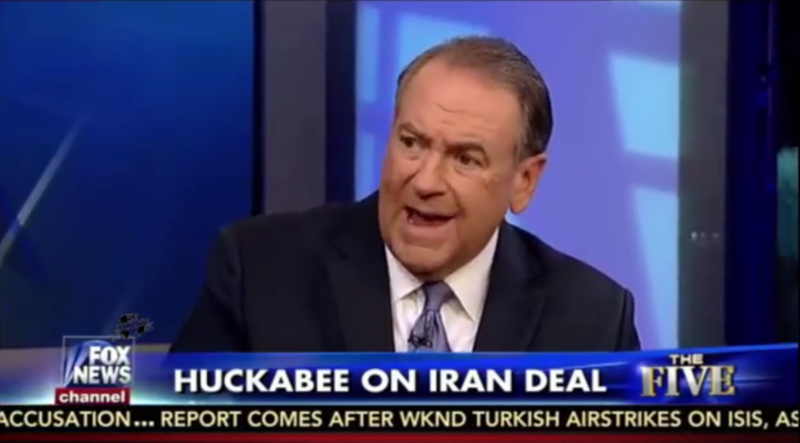 In an interview on Fox News, Republican presidential candidate Mike Huckabee referred to Iranian authorities as “animals” and “terrorists” (Haaretz, 7/29/15). Host Sean Hannity egged the politician on, claiming the nuclear deal will lead to the bombing of Israel and a second Holocaust. It is impossible to imagine the reverse situation—politicians calling Israelis “evil,” liars, “animals,” with media figures encouraging them. The same corporate media that largely ignore inflammatory statements about Iranians would explode. The political figures’ careers would be destroyed; they would perpetually be known as anti-Semites. Yet these same racist attitudes are suddenly tolerated when they are directed toward Iranians. Examples such as Hannity’s goading demonstrate that the US media do not just give a platform from which politicians spread anti-Iranian bigotry; sometimes they themselves dabble in such racism. And it is not just Fox News that does so. Just a few months ago,Time magazine peddled these very same anti-Iranian prejudices (FAIR,4/8/15), showcasing former Israeli ambassador to the US Michael Oren’s orientalist Middle Eastern “carpet merchant” extended metaphor. Such orientalist tropes are by no means new. For centuries, colonial powers used racist ideas to try to justify their oppressive imperial rule. Media often obediently echoed their chauvinistic lies. 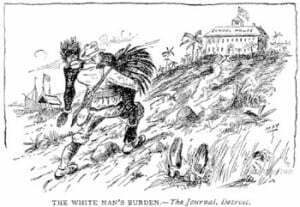 A racist “White Man’s Burden” cartoon published in the Detroit Journal. Rudyard Kipling’s infamous poem “The White Man’s Burden” was published in popular newspapers like the New York Sun, New York Tribune and San Francisco Examiner (7/5/1899). The day after it was published, Congress ratified the Treaty of Paris, establishing imperial control of the Philippines. Just as other forms of racism were exploited on behalf of empire in the past, anti-Iranian racism is today deemed permissible when it promotes US interests. To be clear, there is certainly no dearth of critiques to be made of the Iranian government. It greatly represses progressive activists, labor organizers and women protesting sexist laws. Yet US politicians consistently fail to differentiate between the Iranian people and their government. When Tillis called Iranians “evil,” Chairman of the Joint Chiefs of Staff Martin Dempsey interjected, clarifying that “it’s really the regime—not the Iranian people.” Tillis did not make such a distinction. If a pop singer says something even mildly problematic, there is instantly a vast slew of think pieces published in the media, accusing so-and-so of some form of bigotry. Yet when elected officials make even more outrageous remarks about Iranians, they are often ignored. Some argue this is the inevitable product of the US right-wing constantly making ridiculous statements. At this point, they claim, we should simply expect conservatives to make absurd remarks. Yet the (ideal) job of the journalist is not to make us accustomed to the status quo; it is to hold authorities to task, to check power, to inform the public when leaders are engaging in problematic behavior. War-hawk politicians have no problem wielding racism and bigotry when it is in their political interest. And because they are not held responsible for their extreme rhetoric, they have every incentive to keep employing it. As long as the lackadaisical corporate media let them do so, they will continue. On the other hand, if media do their job and hold the feet of politicians who make such racist comments to the fire, generating rightful outrage, politicians will think twice before calling an entire people “evil,” liars or “animals.” And if politicians are no longer able to lean on racist myths to try to justify their policies—and, who knows, even have to engage with actually existing reality—that can only be good for the rest of us. Ben Norton is a freelance journalist and writer. His website is BenNorton.com and he tweets @BenjaminNorton.